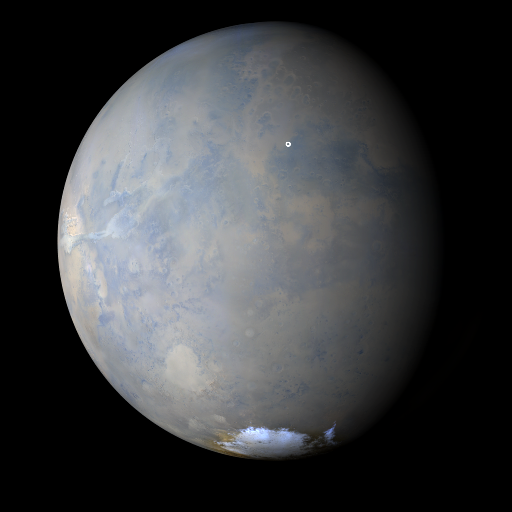 For the past week on Mars, dust lifting activity was concentrated over the southern highlands. Clouds and hazes of dust were spotted from Sirenum to Cimmeria for much of the week. During the last three sols, the regions of Aonia and Sirenum displayed a slight increase in transient storms. Throughout the week, afternoon water ice clouds lingered above Arsia Mons, the southernmost volcano of the Tharsis Montes. Both rover sites, Endeavour Crater (Opportunity) and Gale Crater (Curiosity) experienced storm-free skies all week. Malin, M. C., B. A. Cantor, A. W. Britton (2018), MRO MARCI Weather Report for the week of 24 September 2018 – 30 September 2018, Malin Space Science Systems Captioned Image Release, MSSS-550, http://www.msss.com/msss_images/2018/10/03/.